I love a good MYOTO recipe, don't you? That would be Make Your Own Take Out for those of you who are behind on learning your Rachael Ray lingo. 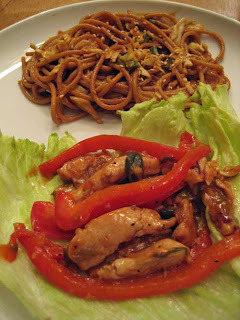 The recipes for Thai Glazed Chicken Lettuce Wraps and Hot and Cold Sesame Noodles are among my favorite Rachael Ray recipes. In fact, I might even go as far to say that the Hot and Cold Sesame Noodles are my tied as my favorite with John's Fish. I should warn you that if you add the amount of hot sauce called for in the recipe, the noodles really are hot. Since that's how I like them, I go for all of it. With the peanut butter and sesame oil, they create a flavor combination that will meet your take out craving. Mine are dark in the picture at left because I use whole wheat spaghetti to make mine. The lettuce wraps have great flavor and the added benefit of being pretty darn healthy. Since you'll get your carbs with the noodles, the lettuce wraps provide a perfect accompaniement. Heat a large skillet to screaming hot. Add vegetable oil, then chicken. Cook chicken 2 minutes, stirring constantly. Add the ginger, garlic, peppers, cabbage and carrot mix and scallions and stir-fry another 2 minutes. [Really, you will be tempted to cook it longer than 2 minutes, but don't do it! You want the veggies nice and crispy.] Add plum sauce to glaze the mixture, toss 1 minute, then add basil and wilt leaves. Add fish sauce and turn to coat. Transfer cooked chicken and vegetables to a bowl. Place spoonfuls of chicken into a piece of lettuce with cucumber and fold lettuce over to eat, like small tacos. this is the best blog everrr... seriously. it's not just the vicodin talking. Even if it is the vicodin talking, I'll still take the compliment, Anony. I am definitely making these noodles, just printed the recipe. Congrats on the pregnancy, I have a feeling you'll be a great mom! I hope you enjoy them, Kalyn! They are definitely one of my favorites. And thank you!